Recently I adapted it a bit to make it a “creamy spinach Parmesan” soup and that was a hit, too. I'll include those instructions below. Heat broth and broccoli until broccoli is tender. Mix cream cheese, heavy cream, shredded cheese and butter in another pan and stir often. When broccoli is tender, put half in a blender and puree (this makes it a little thicker). When the other pan is melted, add to broth and broccoli (in the other pot). Garnish with more cheese. Add sea salt and pepper to taste. This is a 15-minute dinner and super simple, too! Still want to eat bread now and then? If so, did you know that THIS is the best bread you can eat? 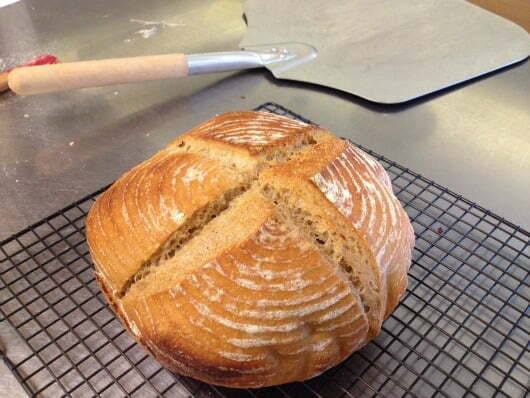 Get step-by-step instructions here: Homemade Sourdough bread. Click here for more low-carb recipe ideas – my favorites these days are the Crispy Roasted Brussels Sprouts, Kale Chips, and this pesto chicken or just cheesy chicken is SO easy, SO good and low-carb! 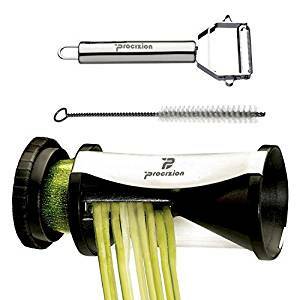 If you're a low-carber or a no-grainer, you'll love the spiral slicer and the cookbook together for some great recipes to help get you out of a rut. I love that the author is not afraid to use healthy saturated fats in his recipes like butter (pastured butter is best), coconut oil, olive oil, etc. Read more about healthy fats here. One more yummy broccoli recipe: Organic Broccoli Salad – this is full of great flavor! Where in the States do you buy non ultrapasturized cream? Thanks. 3. My local grocery store does still carry a regular whipping cream that is pasteurized but not ultra-pasteurized, it’s the only grocery chain where I can find that at when I’m in a pinch, all the other grocery stores around us ONLY have the ultra. I made this for my husband and I for dinner today and it is sooooo good. We are both on low carb diets and have not found many recipes that are really good. This is so good. I used my food processor instead of the blender and it turned out to be the perfect thickness. We absolutely loved it and I am sure I will make this again and again. Thanks so much. I love all the ingredients in this recipe and made it exactly as written. I like it but think the cream cheese took away from the cheddar taste, which I prefer in soups – but it make it thicker so that is a plus. I am low carbing so I make a pot of something I love at the first of the week so I have a quick go to for lunch during the week. I think I will cut the cream cheese in half next time so it has more of a cheddar bite, but for this pot I added some chopped pickled jalapeños. It is now a spicy cheese soup. ebat is your carb count? And how many servings? Nvm, I tried to delete post but couldn’t fig out how! My WHOLE family loved this soup! Made this soup this morning. Mine came out with a very strong cream cheese taste.. Is this normal?? Not sure where I messed up! Tasted way too much like cream cheese and it was real watery. Going to cut back on chicken broth and cream cheese and try again. Wonderful- I refined this to meet my suburban Canadian taste by adding beer and a scant teaspoon of guar gum to the two cream cheese brick version. 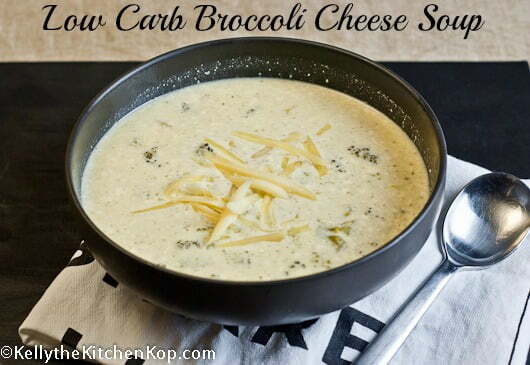 On your Low Carb Broccoli Cheese Soup, you never mention how many carbs. if it’s low, then tell s.
Sorry about that, I asked my sister and she said she told me when she originally gave me the recipe, but I must have forgotten to post it. Others in the comments have added what they thought the carb-count was, but it looks like there’s quite a difference between them. I have been looking for an awesome cheese and broccoli recipe. I have found good ones in the past but not one that would become my go-to recipe in the end. The search is finally done! THIS IS IT. I am just a little bit excited. 😉 I now share this with all the LC’ers I know. The only think I do differently is add a little less broth to keep it thicker. Hi! Just wanted to let you know that my husband and I tried this recipe. He doesn’t cook much, so I asked him to make it and he had no trouble at all with it, and it ended up turning out delicious! Thank you so much for posting it. We added 3 cloves of minced garlic, and half a minced onion to the recipe and it was perfect. Wouldn’t change a thing! My husband and I made this for dinner last night. It was great! We had it with a side of roasted turkey breast. The soup and turkey went so well together, we ending up tearing up the turkey and putting it in the soup. We will definitely be making this again. Thanks! Making this now. adding sauteed onions and celery and garlic. Looks amazing so far! My husbands thanks you! So simple and made on a work night. yum! No heavy cream (though now that I’m at the bottom of the pot I could see the use of the extra liquid, though I think I’d add more broth for carbs’ sake). Omw…….delicious soup!! I’ve been low carbing it for a week now & this is my favorite soup & was so excited to give your recipe a try!! Not only is it a busy cooks dream to put together but so delicious as well. Thank you so much for sharing with all of us. Oh my goodness. I’ve never made broccoli soup before and always wanted to try. I can’t believe how EASY this was and it’s FANTASTIC!!! Gonna let it cool, flavors meld and reheat for dinner (I admit, I snuck a bowl for lunch) I can’t wait!! Will definitely make this again 5 star all the way. Thank you so much. Just made this- sooo delish and much easier than I would have thought it would be! Thanks for the great winter recipe! Question- does anyone know how this freezes? We made this last night. It was easy and loved by all.Thanks for sharing! Wow! I just made this and it is the best soup I have ever had!!! Thank you so much for the recipe!! I took another reader’s advice and just did 2 cups of chicken broth and it was perfect! This is absolutely the best Broccoli Cheese Soup I have ever eaten in my life! Thank you for the recipe. The only thing I changed was lowering the chicken broth to 2 1/2 cups instead of 3 for a thicker soup. Excellent! I made 2 batches so I could have some throughout the week because I just started a low carb diet, unfortunately, my husband DEMOLISHED the entire container before I woke up the next morning. it is THAT good! I also wanted to mention that the Walmart brand of heavy cream is the thickest on the market and makes the best cream soups. Ummmm, yes, I just checked and it is ultra-pasteurized. However, I am not sure what that means or why it is not desirable. Can you please elaborate? Thanks. Thanks for the information. I had no idea there was a difference. Definitely going to try this. I’ve been craving broccoli cheese soup, but couldn’t have it. This sounds perfect! Thanks. Thank you! That was the best broccoli and cheese soup i ever ate! cream cheese so it was thicker. Very tasty..
suggested uncured crumbled bacon, yum! I calculated 23g net carbs for the whole thing. I got 4 two cup servings so it was 5.75g net per serving. The broccoli alone is 80 carbs minus 32 net carbs so this is wrong. Atkins.com shows 1/2 cut raw broccoli as 1g Net Carbs. So I’m not sure how you come up with 80. I don’t think 2 bunches of fresh broccoli = 40 cups. Can you help me understand your math. 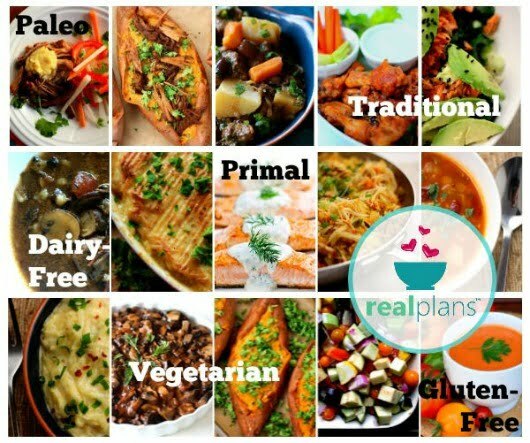 New to a low carb diet plan. Depends on how much brocoli you choose to put in. I only used 100g which net carbs were 4.4g for the whole soup. I added 30g of spinach which was like 0.3g of carbs for the whole thing. So i think 5.75/6.5 g if carbs per serving is probably accurate. Maybe less if you like me and had only a cup perserving. Made this soup tonight. It was SO good!!! For my 3 sons and husband, who aren’t on a low carb diet, I made a roux and thickened some of the soup and served it over whole grain pasta for a yummy broccoli cheese alfredo dish! Good job making it work well for the whole family! Thanks to those of you reviewers who actually TRIED the recipe before commenting. That’s useful! My daughters said this was better than Panera’s. I even caught DH eating some. Soli, yes, homemade cream cheese is best, but I cheat on that a lot and just make sure to by the regular, not low fat, obviously. Sandy, yes, anything but Velveeta! LOL!! That sounds great! I take it the cream cheese here should be traditional?